Ready to Radically Improve Your Presentation Skills? Did you know that one of the most powerful ways we can grow active, sustainable, mindful mobility and reduce our single car traffic congestion and pollution is by using the power of public speaking and storytelling to change hearts and minds? Did you know that data doesn't change hearts and minds, only emotionally engaging stories do? Our human brains are literally wired for storytelling. In this 17 page white paper pdf I share the ten most important skills I've learned from some of the most masterful speakers and trainers in the U.S. I've put them into practice myself. I know they work. If you use them you'll radically transform your speaking skills and gain new fans and followers. Let's get you started! Share a little about yourself and then click the link to download your white paper now! First tell me a little about you! 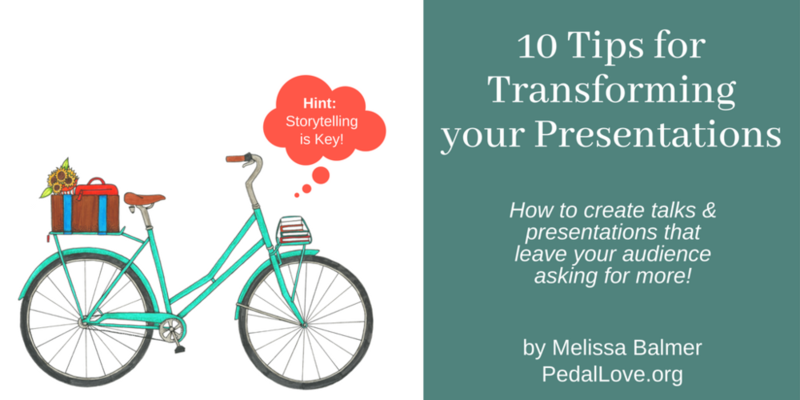 >> Click here to download "10 Tips to Transform Your Presentations"